I use a PTTL cord between my Pentax cameras and a Metz 58-AF2 flash unit. I have two PTTL cords and this is my experience of each. It's also possible to use a radio transmitter for PTTL HSS (Acon R930). A PTTL cord is a fairly binary exercise: they either work or they don't, and there's only so much that can be written about them. Walimex flash extension cord, a bit flimsy and the mechanism tilting the flash isn't the strongest. I ended up using a spanner to tighten the nut which meant it now stays in place. It has trouble coping with the weight of top range flashes. But, on the other hand, it does work, it's never gone wrong on me so it does what it's supposed to. The Walimex flash extension cord comes with a flash shoe on the side and a swivel mount including a 1/4 inch thread and 1/4 inch screw on the other end. These are connected by a curly cord which extends 2m in length when fully stretched out. At the PTTL flash shoe end there is a knob which can be loosened to adjust the angle that the flash stands at. 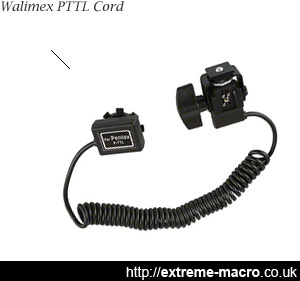 All PTTL functionality is available with this PTTL cord. In truth, the Walimex flash extension cord is a little bit flimsy and the mechanism tilting the flash really isn't the strongest. I ended up using a spanner to tighten the nut which meant it now stays in place. It has trouble coping with the weight of DSLR flashes. On the other hand I do use the top flashes and they tend to be the heaviest so maybe a medium flash would sit better on these. Bottom line, yes, it does work, it's never gone wrong on me so it does what it's supposed to. Nissin SC-01 universal off camera shoe cord, the best Pentax PTTL cord I've managed to find. As far as I know it's the only all-brand off-camera cord with which you can mount the other shoe either into the first one or away on its own. Expect to pay roundabout £50. The Nissin SC-01 Universal Off Camera Shoe Cord is better made than the Walimex unit but lacks the tilting functionality that the Walimex has. It extends to 1.5m and also has a curly cord between the camera unit and the PTTL end. I bought the Nissin for a specific feature that the Walimex lacks, namely the secondary shoe that can be mounted with an adjustable shoe mount on top, which allows me to attach a horizontal Metz 58-AF2 flash on top of that. So a sturdy right angled connection (although I do give it further support with a DIY construct to take the weight of a horizontal Metz 58). On the Nissin, the PTTL shoe which fits to the main camera body has a secondary hot shoe on top, which means that you can attach a flash in two different positions, either on the top of the camera unit or at the end of the curly cord. Quite why a manufacturer would want to make it that you can't use both at the same time is a bit beyond me, but never mind. The Nissin SC-01 Universal Off Camera Shoe Cord has a specific purpose in my arsenal which is use with the universal Mpe-65, using a Hama flash tilt unit with a horizontal Metz 58-AF2 flash. The PTTL shoe at the end of the cord also has a plastic shoe mount underneath and with the three bits together I get a nice PTTL unit at 90 degrees, perfect for my anybrand Mp-e 65 and night macro setups. For studio macro, I use a Metz 58 on this Nissin unit to control several pentax wireless flashes (Pentax 540s). This works very well indeed although the curly cord on the Nissin unit is only barely long enough to reach the 58, because the 58 always shoots from the bottom of the photo. I have the 540s either side of the diffuser, intentionally, because being the same model the light will balance on either side if set to the same value. In 2016, I've also started using the Nissin SC-01 Universal Off Camera Shoe Cord outside for butterfly photography. I've made a dual arm bracket, the flash on the right is triggered by a cheap radio trigger and does fast machine0gun like aperture bracketing. A different flash on the left is triggered by cord, and does HSS bracketing. HSS bracketing is a slower affair, about a shot per second. I have to thank the Nissin for this dual setup because there's a switch on it, so I can toggle between output going to the camera mounted end of the Nissin (the base unit) or other end. This way I can guide camera output to the flashes if I have the radio transmitter on top of the Nissin SC-01. It works well, but it is quite heavy, as there's also a 70-200mm and extension tube in this package. I've put together a guide on how to build a PTTL extender that uses common ethernet cables. It's pretty easy to do and lets you get the flash much further from the camera than Pentax's own cables or the third-party cables in the article. The process can probably be adapted to extend the cables shown above. Hello i read your article. I am searching a flash cord for my pentax k20D and my flash metz 52 aF1. Do you know if the HSS mode works with this cord? Hi Johan - Just a question about the configuration shown for the Nissin in the photograph above. Are the two Nissin flash hot shoes both mounted on top of the camera; that is in piggyback? Which of the switches triggers the flash mounted on the very top of the two? Does the flash function in that configuration please? If you wished to fire two flashes, one on top of the camera and a second on the Ext Hot Shoe, could the second be fired by optical trigger from the one on the top of the camera. Thanks.